No more looking after gear and keeping up those charges! 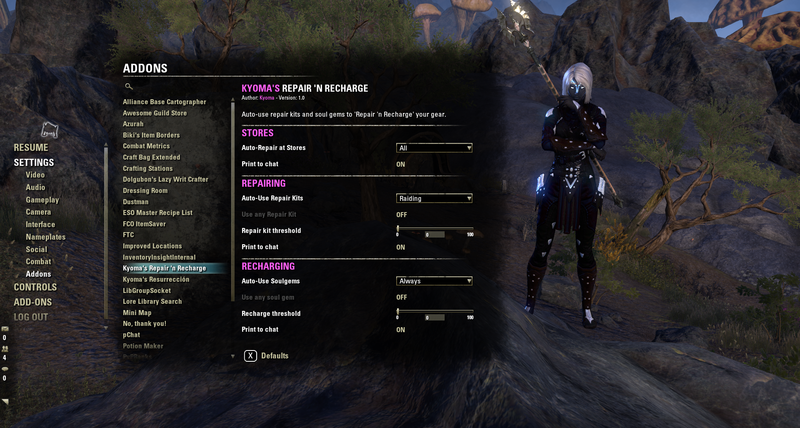 A simple addon I wrote over 2 years again that repairs and recharges your gear automatically, even in the middle of combat. Thresholds can be configured for both but unlike in the past there is no reason to repair or recharge something above 0%. Not much more to say really. Also provides two slash commands: /repair and /recharge for when you want to trigger those actions manually. Optionally pass a number specifying the threshold, otherwise it will use whatever you have configured. - Fixed bug where an item might not be recharged at 0% even tho the item enchant cannot be used anymore. Does this add on still work? noticed that for a few days now my armour was showing broken. Checked settings, reloaaded, etc. but no luck. Had to manually repair. I love this add on, so am hoping it is still functioning, and this was just a happenso. Any news about this "inconsistent behaviour" ? Anyone who had it happen and can say: new game patch changed things? - No issues for me anymore, but needs more testing. Last edited by wambo : 11/04/18 at 01:27 AM. Hmmm, while I've experienced times where it seemed to repair an item twice (I'd get two identical lines printed to chat) it never actually did it twice. It sounds as if it gets stuck in a loop, which shouldn't happen under normal conditions. I can probably add a safety check to prevent the loop but it wouldn't fix the reason why it gets stuck due to strange conditions. And FYI: I myself have not had any issues nor have I heard this from any of my friends. While I'm not saying it doesn't exist I would like to ask you refrain from outright declaring this broken and recommending people to not even try it. Last edited by Kyoma : 08/19/18 at 04:37 PM. Same for me can confirm my char gets invisible and I go to alt+F4 then ESO is still in taskmanager with 99% GPU use. Did lots of death try in new dungeons yesterday and the DCs always happend when the rechage massage showed in chat. Any chance to have a account wide profile added? planning to update this? The out of date thing is making me worried that it might make some fps issues I have because its the only outdated addon I keep on... :/ Also my gear does not get auto repaired with the option on and I have around 70 biggest repair kits in inventory. I've heard from a few friends that it no longer works for some people but I am unable to reproduce such issues for myself. Is there anything more you can tell me? If you have "Print to chat" on, do you still see messages or just nothing at all? Also, what happens when you use the keybind to repair? As for being out-of-date, it shouldn't cause any issues but I'll be updating soon after I have a chance to look into the issue. Should I not find anything I'll be adding some debug code to help figure out why it doesn't seem to work for you. Does the "Use any Repair Kit" and the "Use any soul Gem" mean using low level kits and gems before you use the max level ones? It should be using lower tier kits first but to be honest that feature dates back to when soulgems still had multiple sizes. And while the repair kits still have multiple tiers it wouldn't suprise me if something changed in the background. I'll see if I can find the problem with it. Edit: Upon further inspection I see that it will always start at the level of the item and I remembered why I added the option. It was originally intended so that higher kits would be used if no matching kit was found for the item's level. It is probably a good idea to also start with lower kits as you expected. Last edited by Kyoma : 06/05/18 at 07:51 AM. my bowbar (offbar) didn't recharge automaticly. I will report if this happen again. Anything particular about the bow? Was it by chance a master/maelstrom one? It shouldn't matter but still. Also, are your settings still on default? If it happens again, could you try typing "/recharge 0" and see if that atleast works. If that doesn't work then try "/recharge 5". I suppose it might be possible that the charge stays slightly above 0 but it is still considered empty by the game. was a msa bow... i will report after next time weapon charge is empty. Last edited by Kyoma : 10/17/17 at 12:24 PM.